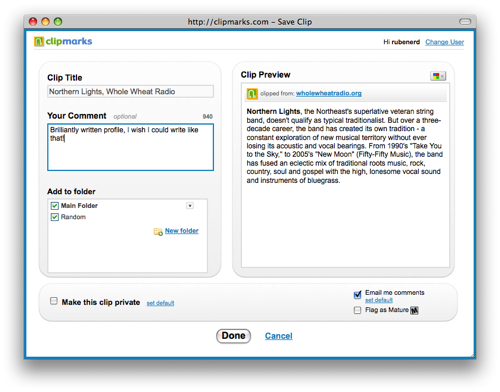 On Clipmarks.com you can save clips of text, images or videos you find on the web, and see what other people are clipping. Clips you save publicly will be included in the feed of Newest Clips by everyone. If other users like a clip you post, they will "pop" it over to the latest pops page for others to see. If you consistently post clips that other users find interesting, they may add you as a Guide to easily keep up with all your clips. The idea is you install the Clipmarks plugin which places a small paperclip on your Firefox toolbar. When you reach a page with a block of text you want to keep and share, you click the bookmark then click and/or drag your mouse over those areas then click the Click Here When Done Clipping button that appears above the page. A new window then appears which asks you for a title as well as an optional description and categories. When you’re done, these clips appear on your profile page, in my case its here. Popup that appears when you’ve selected the parts of the page you want to clip and share. You can choose to keep clips private too. I’ve been looking for something to help me remember individual quotes instead of pasting text into files or just bookmarking an entire page on Delicious for assignments and personal use for quirky, funny and/or interesting individual quotes and media I find. I reckon this might be a great way to do this. What I’m really interested in though is being able to take quotes from pages and post them on my blog in a similar way to sharing items on Google Reader. So far the only problem I’m running into is the automatically posted quotes here really do not match the colour scheme I’m using here, and all the extra formatting seems a bit excessive, plus they don’t validate as XHTML 1.0 Strict either. I wonder if there’s a way to automagically export raw text and images instead of having all the formatting? Guess it’d be pretty easy to write a script to clean the posts up. Anyway getting a bit ahead of myself here, I’m still playing around with it for now. I’ll post a longer review once I’ve learned more. Anyone else use Clipmarks and have opinions? I know from Jim Kloss that the links are working for him, we’re off to a good start!